Since joining sparkpeople.com, I've come across many new low-calorie recipes. Some of the recipes they suggest though, are just not for me. However, after I tweak them a bit, I end up with something we love. We normally eat this muffin with our breakfast or for an evening snack. I hope you enjoy it! I really love to spread a little peanut butter on it...it's just so good. A match made in heaven...peanut butter and bananas! Next time I'm going to try making this with dark chocolate to see how the calories work out, if it's good, I'll share it too. In large bowl whisk flour, oat flour, baking powder, baking soda and salt. In separate bowl, mix bananas, sugar, yogurt, egg and vanilla extract together. Pour into the dry ingredients and add cinnamon. Scoop into a muffin tin sprayed with nonstick cooking spray. Bake at 400 degrees F for 12 minutes or until toothpick tests done. Don't forget to check out my new eCookbook Sweet Creations Volume 1 "Basic Southern Cakes"! It's only $2.99! Those sound yummy...I'm going to have to try making some! Looks great Candi! I make a similar one with peanut butter in them too (about 6 Tbsp for a batch like this). So yummy and such a quick breakfast or on-the-go snack! Thanks for sharing your recipe! Your gardens are coming along beautifully. Love the hydrangea. Veggie plants look good and before long they will be full. I'm going to check out the recipe. I came across your recipe on Real Food Wednesdays. This looks simple and healthy. Thanks for sharing. 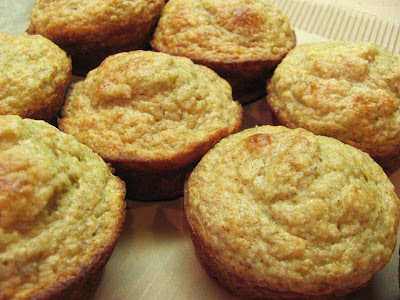 I love banana nut muffins but adding the oat sounds perfect! This would be perfect for my Foodie Friday linky party - stop by this week and link up! Thanks so much for linking up your delicious recipe at Muffin Monday. Please join us again this week! I've got some friends that swear by Spark People...I have to say you make it look very good! What a great, healthy recipe - and low cal too - fantastic! Thank you for sharing it with Let's Do Brunch. Hope you will share another great recipe with us again this week - the linky is up now.